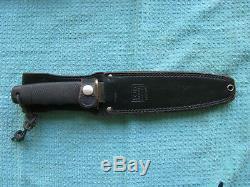 New Lower Price Offered for sale is a Vintage SOG Tech II (Tech 2) fixed-blade hunting/fighting knife, probably ca. 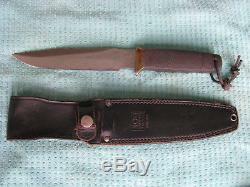 1990, made in Seki, Japan, an area known for making some of the world's finest blade steels. When this knife first came out, it was called the Tech. When SOG introduced a smaller version of this knife called the Tech 1, they started referring to this larger model as the Tech 2. 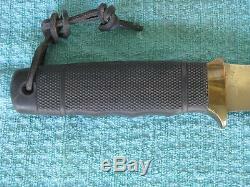 This knife features a carbon steel clip-point blade, brass hilt, and a Kraton composite handle with a lanyard hole and diamond-pattern texture. 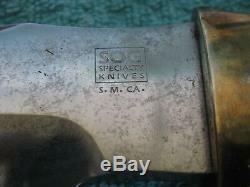 According to the SOG Knives Collectors website, this is one of the earliest and rarest of the Tech II knives, since it has the tang stamping SOG Specialty Knives S. The blade could be either SK-5 or AUS-8A carbon steel, since SOG was known to use both at the time. On the earlier Tech II knives such as this one, each blade was hand-ground from 1/4" stock, and finished blades tended to vary from 7" to 7-3/8. " 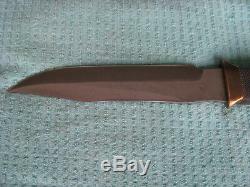 The overall length of this knife is 12-1/4" with a blade length of 7-3/16", and the blade is 1/4" thick at the hilt. 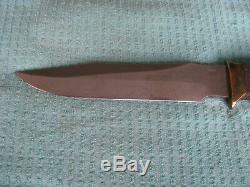 The knife is in excellent condition overall, showing signs of occasional use and carry. 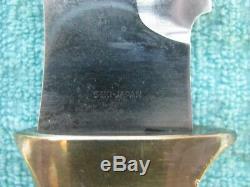 The blade appears to be at least 99% intact, and shows some minor pitting throughout. 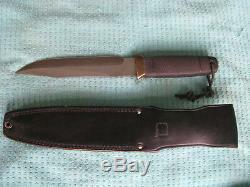 This knife includes its original leather ambidextrous sheath. 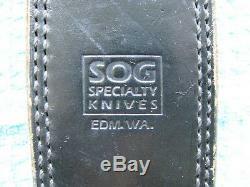 This knife is very well made, and will provide many more years of service with proper care. Or, it would be right at home in a collection of fixed blade knives. The item "Vintage SOG Tech 2 Fixed blade Hunting Bowie Knife withOriginal Sheath" is in sale since Thursday, November 22, 2018. 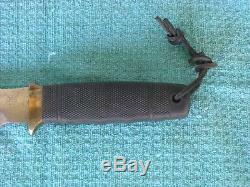 This item is in the category "Collectibles\Knives, Swords & Blades\Collectible Fixed Blade Knives\Vintage Fixed Blade Knives\Factory Manufactured".com" and is located in Daytona Beach, Florida. This item can be shipped worldwide.